4 bedroom, 2.5 bathroom villa in the Buenaventura Lakes community. Owned by Jan & Michael Staines. Ref: 780.
" Everything we needed to make our stay truly magical"
For privacy reasons, the marker on the map shows the Buenaventura Lakes community location and not actual villa location. WHY RENT OUR HOME ? You must take a look at Orlando Villa Londra to make that decision ..... because if we mention, location; 4 large bedrooms; living room and family room; fabulous private pool; air-conditioned games room; conservation view; luxury and affordable we would be trying to sway your judgement! Orlando Villa Londra is west of Buenaventura Lakes in a residential estate bounded by (very roughly) 417 Greenway to the north and John Young Parkway to the west. Set in a peaceful and tranquil location with some beautiful conservation areas. 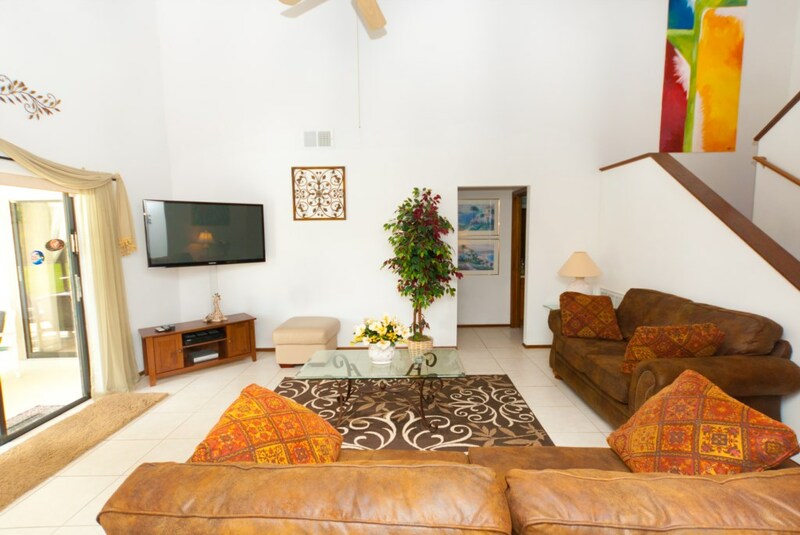 Not only will you be nestled into a beautifully appointed vacation home but you will also be conveniently situated for your travels to the theme parks. 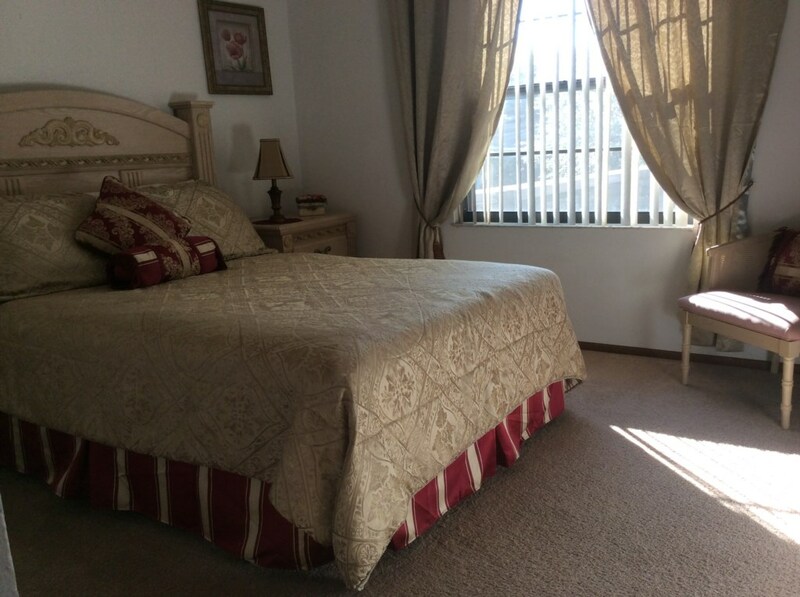 In addition your location will allow you to explore other parts of Florida including the fabulous beaches, the very quaint downtown Kissimmee area, Silver Spurs Arena and St Cloud to mention but a few. By taking either Osceola Parkway or Greenway (417) southwards you will easily get to Celebration, Highway 192 west, Lake Buena Vista. Or Greenway (417) will take you northwards to Cocoa Beach, Winter Park and points north of Orlando without ever having to drive on the very busy I4 at all! Irlo Bronson Highway (192) will take you east to Melbourne Beach and along the east coast of Florida. Having easy access to the Florida Turnpike which will take you to Miami and beyond, dont forget to stop of at West Palm Beach, Lake Worth, Boynton Beach, Boca Raton and Fort Lauderdale en route, they are all just lovely to visit and break up a long journey. And of course, convenient for the airports being just 15/20 minutes drive from Orlando International Airport and 50/55 minutes drive from Orlando Sanford Airport. Tampa (West coast) 75 mins. We have Wal-Mart, Winn-Dixie and Publix, Macdonalds, KFC/Taco Bell, TGI Friday and Cracker Barrell, plus Pizza Hut and Domino - free home delivery service, all within 5 minutes of the villa. And, if the children really cant do without Macdonalds its JUST 2 MINUTES AWAY - Don't worry Mum & Dad, it's a drive thru too! 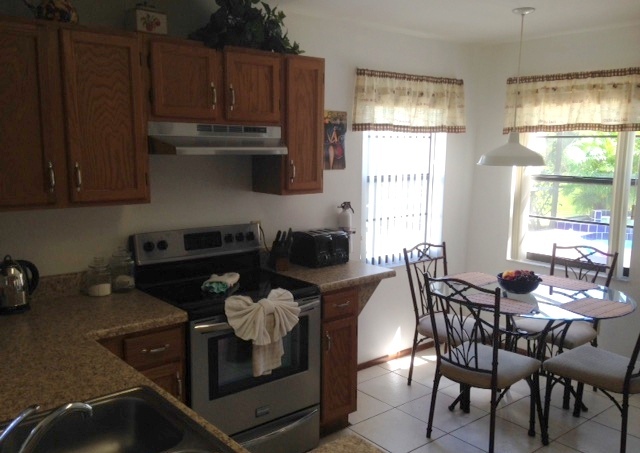 Just 2 miles from The Loop on Osceola Parkway only 4 minutes drive. Where you will find some great stores including JC Penney, Kohls, Ross, Bed Bath & Beyond and Old Navy, in addition to the Regal Cinema, and plenty more places to eat. We can recommend Mimis Cafe; Macaroni Grill, Shanes Rib Shack and for a quick bite Wendys. Oh and dont forget to visit Ben & Jerrys for some yummy ice cream!! DVD rental, 24 hours shopping, air-boats rides, balloon rides, helicopter experiences, several golf courses, Biking, Boating, Cinemas, Fishing, Horseback Riding, Miniature Golf, Nature Trails, Restaurants, Shopping, Skiing, Swimming, Tennis, Outlet Malls nearby, Water Skiing, Petting Zoo. fabulous conservation view and no rear neighbours! Safe area for the children to play. 1.5 miles from The Loop with its restaurants, departments stores and cinema. ¤ The ground floor Master Suite with luxuriously comfortable Queen bed with pillow topped mattress, and en-suite facilities which include a huge walk-in shower (big enough to share! ), hairdryer and curling tongs too. 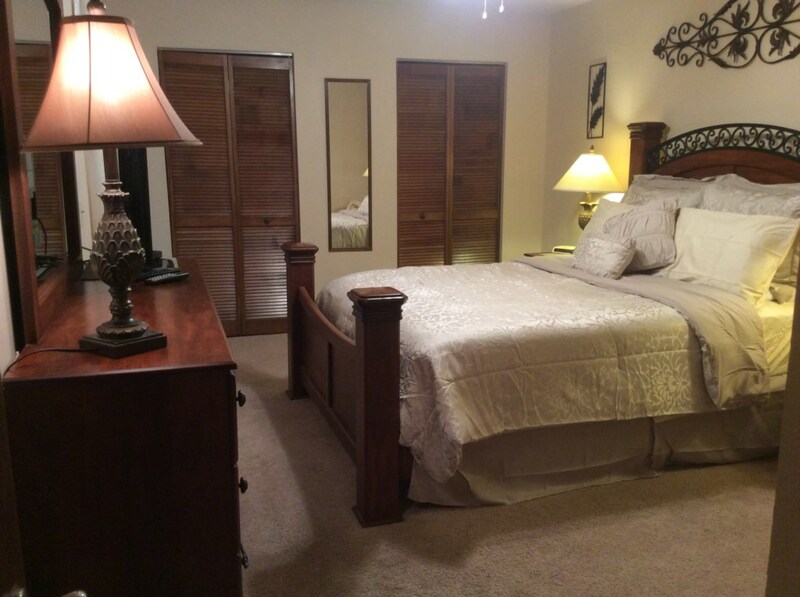 The Majestic Master has beautiful rosewood furniture, digital cable TV, ceiling fan, telephone and wi-fi. Your Majestic Master Suite has glass sliding doors to the pool area. The convenience of being on the ground floor is especially handy for those who are unable to use stairs. ¤ Half-bathroom is also conveniently situated on the ground floor. 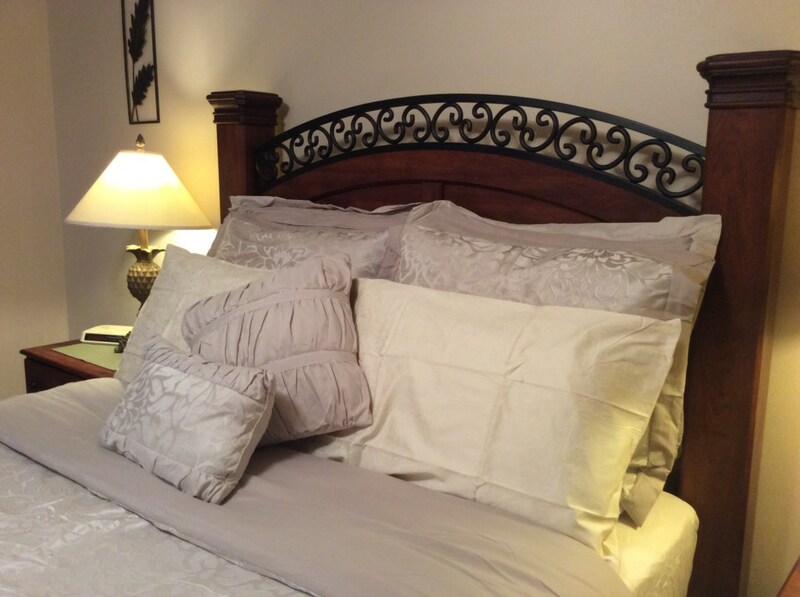 ¤ The first floor Guest Queen is a lovely room which has been furnished with beautiful chic furniture, luxurious queen (5) bed with pillow topped mattress. A tranquil room overlooking the vast conservation to the rear of the property. In the Gorgeous Guest Queen room you can enjoy the cooling wisps from the ceiling fan with gentle awakening by the alarm-clock radio - just because we don't want you to miss that special event at the park! 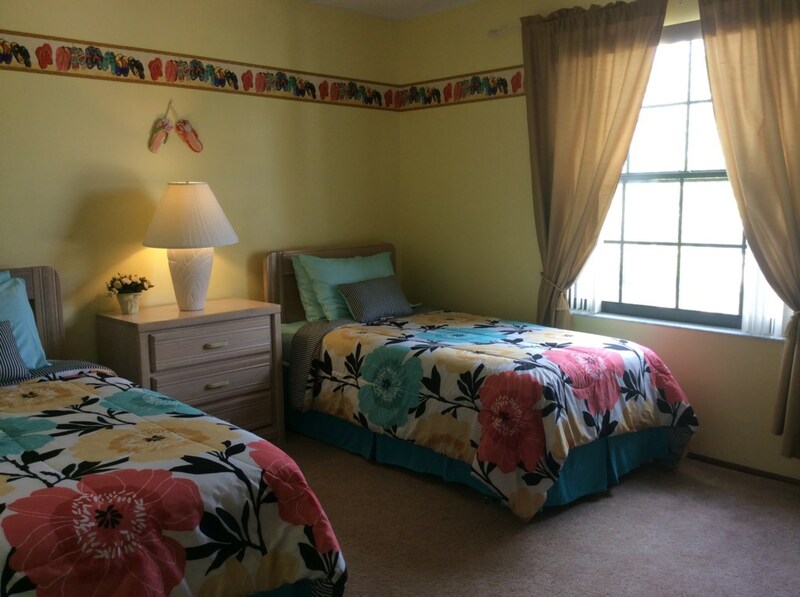 ¤ The Twin Bedrooms are both decorated to delight tots to teens. 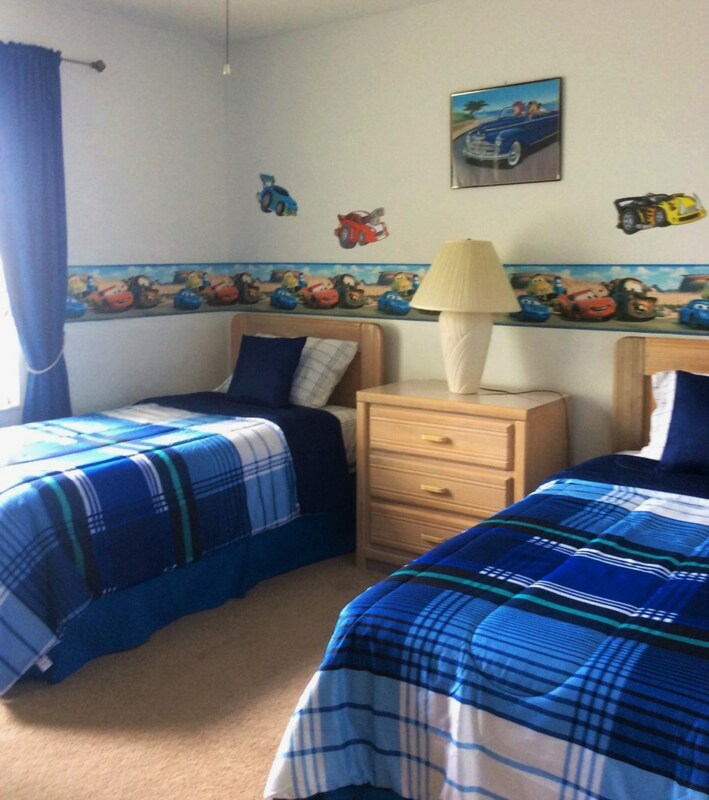 The Beach Twin and Supercharged Disney Pixar Cars Twin are furnished with 2 twin beds in each room, large wardrobes and storage cabinets. Each twin bedroom has a flat screen HDTV/DVD combo, the Beach Twin with cable, Playstation and assorted games plus suitable DVDs, and ceiling fan too. Our Beach Room Twin beds can convert into a King bed, and can also accommodate a fold-away bed. ¤ The Family Bathroom has a full size tub, over-bath shower, vanity basin, toilet, hairdryer and hair straighteners, in addition to an abundance of luxury quality towels. ¤ The Living and Dining Areas are in one very spacious and airy open plan room which has a 17’4” vaulted ceiling. This luxuriously furnished room overlooks the pool and sunbathing deck and in addition to full air-conditioning has been completed with a ceiling fan, 51" PLASMA Flat Screen HDTV with over 230 channels of digital cable TV to choose from including Disney, films and sports channels, DVD player and HiFi system for your enjoyment. And don't forget that super cool tiled floor! ¤ The bonus extra space in the Family Room which overlooks the side and front gardens of the property and allows you to relax and enjoy some quiet time away from the children, whilst still having the convenience of a 40" flat screen digital TV, DVD player and DVD library for everybody to enjoy. ¤ The fully equipped Kitchen has all modern appliances, including dishwasher, microwave, toaster, ice-making fridge, George Foreman grill, waffle maker, blender, teapot, coffee pot and good quality crockery and cutlery for twelve place settings. Breakfast table in the nook overlooking your own pool area plus Breakfast Bar too. 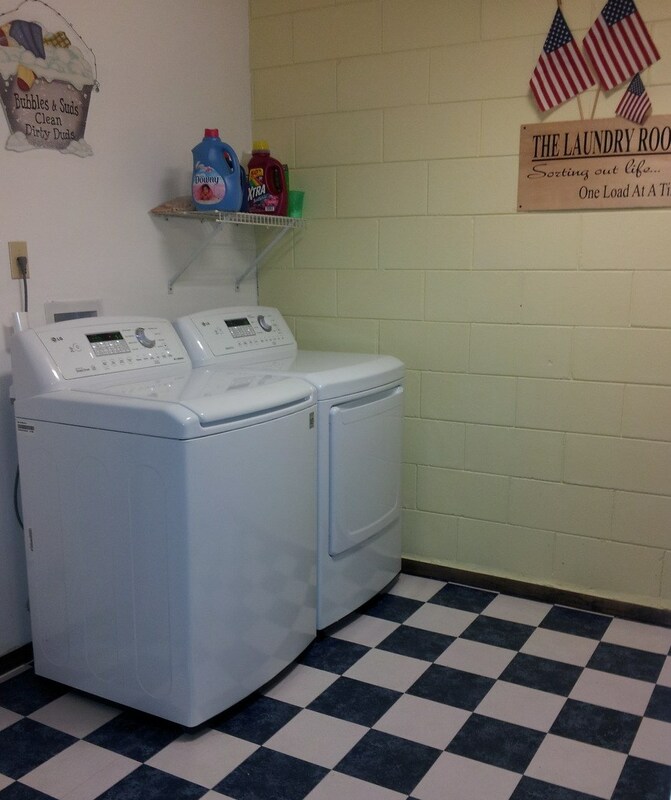 ¤ The Laundry Room has brand new appliances, iron and ironing board, and clothes airer. 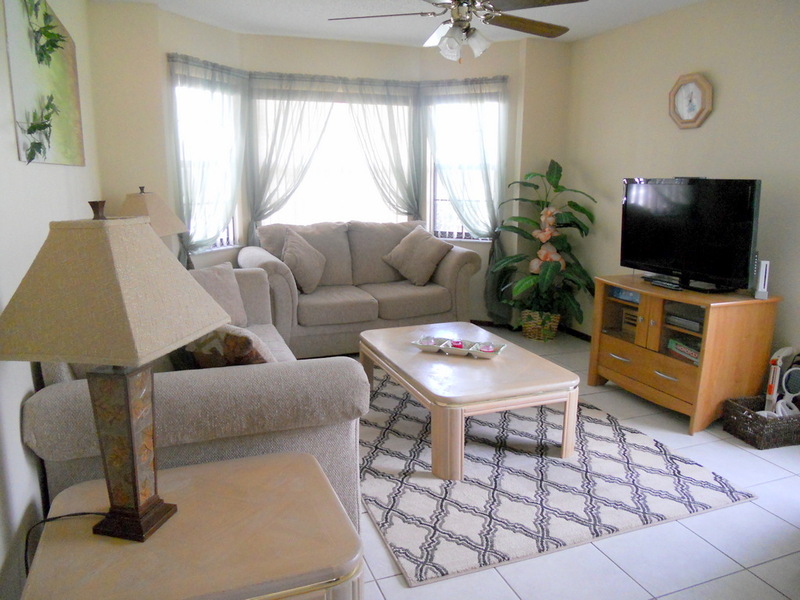 ¤ All rooms in your vacation rental are air-conditioned by a brand new air-conditioning unit and also fitted with ceiling fans for added comfort on those super hot summer days in Florida. Cool tiled floors in all living areas. ¤ Our vacation villa is a strictly no smoking home; if you wish to smoke this is only permitted outside in the pool area. ¤ WOW your own fully enclosed private screened and heated 30 x 15 south-facing pool backs onto a conservation area, no neighbours overlooking from the rear to intrude on your privacy. Your own private pool ranges from 3’ to 5’ deep and is enhanced with underwater lighting and tropical planters. Your screened sunbathing area is furnished with top quality padded loungers and chairs; side tables and dining table, as well as 4 sun loungers. Relax around your own private pool with a chilled glass of wine or beer while the BBQ sizzles away. ¤ For younger and older guests alike we have a Games Room with foosball, air hockey, Table Tennis, electronic Darts, PlayStation and assorted games, a toy box for the tinies, with a variety of toys and games, plus pool inflatables and buckets and spades for those days at the beach all adding to the fun of your Florida holiday. ¤ Paperback novels and magazines for you to read whilst relaxing around the pool. 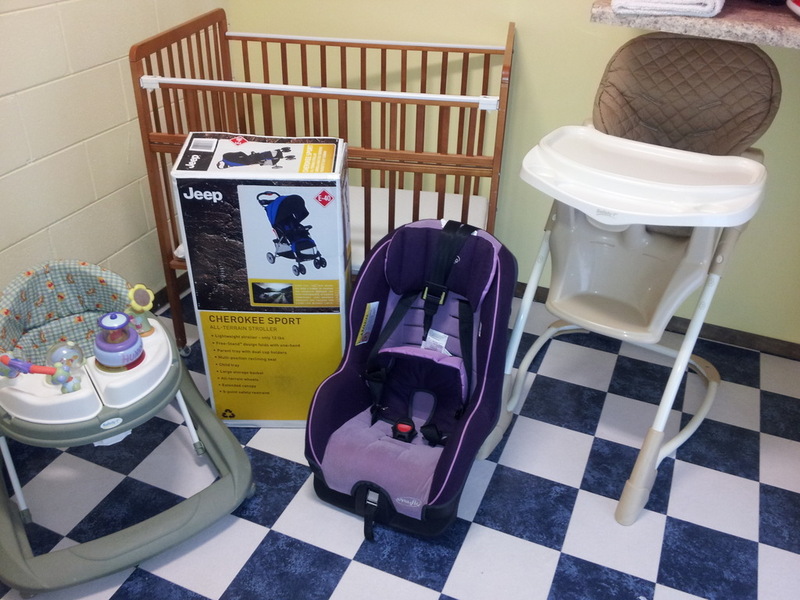 ¤ BABY EQUIPMENT PACKAGE containing all essentials: full size cot, including sheets and blankets; pack n play; highchair; stroller/pushchair; baby buggy x 2 and baby-walker; and for a slightly older toddler a bed rail/guard - all free of charge. We have baby monitors too. "We had a wonderful stay, and would recommend your villa to anyone who asked." The beds are extremely comfortable, we all slept very well indeed, which is unusual for us when away from home! The table tennis was very popular with our kids (and my husband...). Great fun. Us women on the other hand loved the washer and dryer (if only we could get tubs that size in the UK)! It really helped us to be able to wash and dry our clothes/towels regularly as we could 'travel light' and not bring so many clothes. We loved the fridge/freezer - being able to get crushed ice and cold water throughout the day was fantastic. The pool is wonderful - nice and private but plenty of people-watching opportunities, and it's nice to have a pool big enough to swim lengths in! Thanks again for your help answering my incessant questions, and we hope to be able to visit Villa Londra in the future. This villa met our needs perfectly-5 college students on spring break with a tag a long mom. :) Spacious and comfortable, there was room for everyone to have their privacy with well laid out areas for get togethers. The price can't be beat and the villa location is convenient for those going to attractions and beaches on either coast. I would highly recommend this villa for those wanting good value, comfort and easy access to the area. 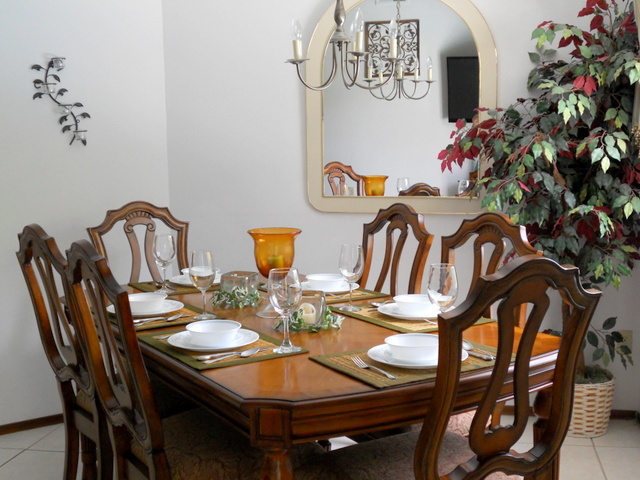 Ideally situated, beautiful, spacious, clean and comfy house for a large family. Our grandchildren loved the swimming pool as did the grown ups. Easy access to theme parks. Jan was very helpful with any questions and prompt to reply. Wouldn't hesitate to come back and stay here again. The villa was very clean and comfortable. The pool area was very private and most enjoyable. We were traveling with two small dogs and being next to the conservation area provided a great place to walk them. The house is well equipped with everything imaginable. You really only need to bring your clothes and everything else is provided. Having a covered area on the patio provided the shade necessary to get out of the sun when you needed a break from the heat. We would certainly recommend this villa for your vacation enjoyment. Stayed at the end of May 15. We were a family of six. My wife, 2 children and my parents. The villa had everything we needed and we had a amazing time. Jan was very helpful. We did most the parks, disney,universal, seaworld and discovery cove which I would recommend(dolphins and sea venture). We also did a day trip to the everglades and miami with gray line which was a great experience. Every area was lovely and clean. My parents had there own area, so we was not on top of each other. We all loved the pool area, found it hard to keep the kids out. Great location. Parks all near. Shops near. A car is essential tho really. Hoping to return in a few years and would not hesitate to return. Thanks Jan for a amazing holiday. Thank you so much for the use of your beautiful villa (10/11 to 10/18). We had a wonderful holiday, the weather was perfect & such a short drive to Disney Parks. There was plenty of room for everyone, the children loved swimming in the pool every day & our little yorkie was happy & content just being with us! I hope you found everything in the house in good order. We maintained it just as we would our own. Again, it was a pleasure. You have a lovely, comfortable home. Having been to Orlando before (this our 4th stay) and having stayed in condos previously, we decided to try the villa experience. We were not disappointed!! Without exception the whole family could not fault your villa at all. It had everything that we could possibly need (evenness down to the toys for the pool), was of a very high standard, very spacious and very comfortable. Location wise it could not be any better. We intend to go back next June but will very likely require a bigger villa as more of the family want to come with us if not we would have been more than happy to use your one again. 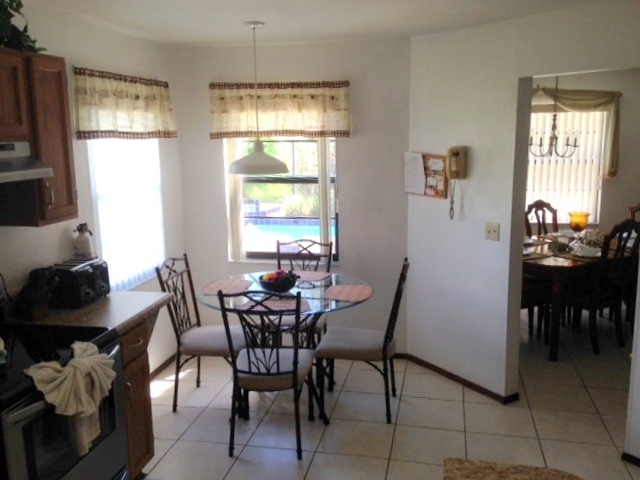 I will certainly recommend your villa to any family and friends should they look to go over to Florida. "Its pretty amazing how well kept this house is." Just got back from my Florida vaca. This house of yours was unbelievable. Very pretty and neat. Too bad we were there only for two days and couldnt enjoy the house fully. We just used our time in the pool with all the kids. The games will have to wait ;) until we get back to Orlando sometime in the future. We had a fabulous time and the house was just perfect for us. 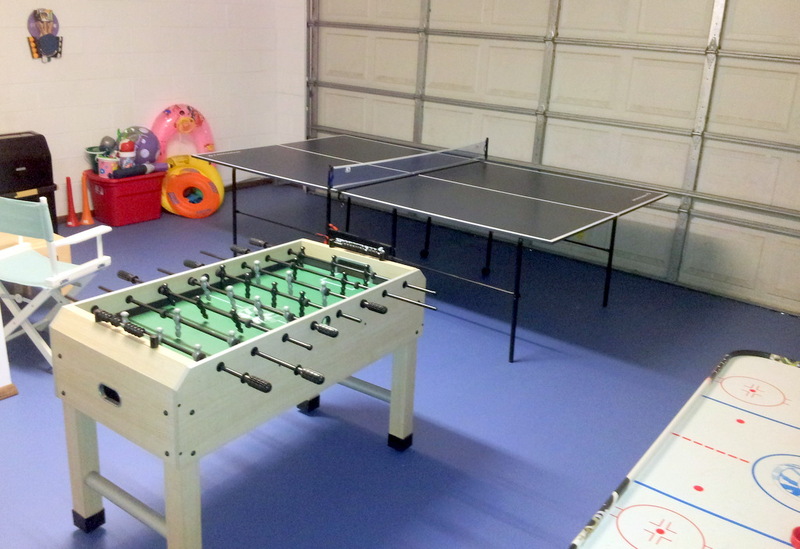 The kids especially loved the pool and games room. Your instructions and recommendations were perfect for our holiday and helped us to find the places we needed to go. We will definitely be back again. Once again thank you very much for making our holiday perfect & comfortable…. We had a great break, I have never spent a vacation in one place before (preferring driving holidays) but I can really say that I loved our 2-weeks at Orlando Villa Londra. It was hugely relaxing and very convenient for the local attractions and shops. We are about to step out into the Orlando rain (our first day time rain of the week) but before we leave for Key West I just wanted to say thanks - weve had another great week. Just a note to tell you how much we enjoyed our stay at your home. Of course the pool was the crown jewel, the grandchildren were like fish, they enjoyed the pool more then Disney. Your location is wonderful, it was perfect with the lot next to the house and the woods behind. Patty was very nice, checked on us, to see that all was O.K. Thank you again for sharing your home. I simply cant tell you how wonderful your villa was. It was perfection in every way. We are saving our pennies and will definitely be back. Thank you so very much.
" Everything we needed to make our stay truly magical. and it was difficult for us to drag them away from it! On top of this it was close to all the major attractions and amenities. When asked what the best part of the holiday was my 4 year old daughter replied "the swimming pool"!! " “Thank you for letting us rent your villa. It was very clean, comfortable and welcoming. Also it was in an ideal location for all the attractions. 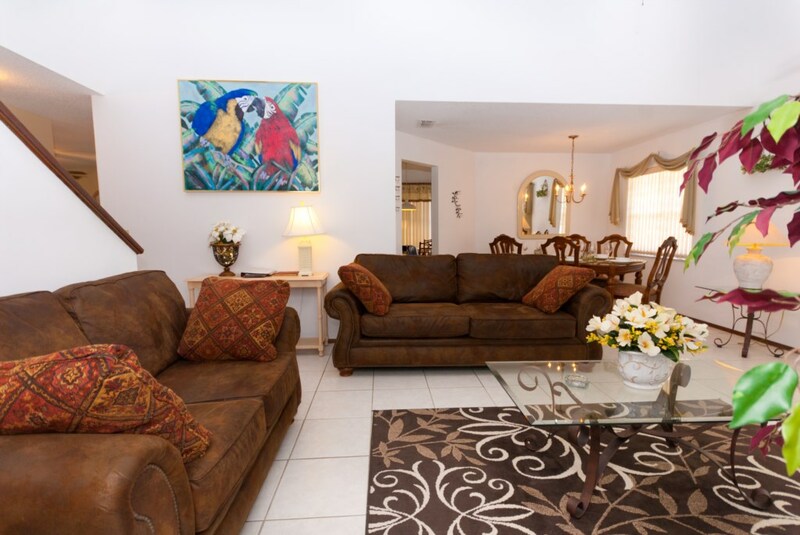 "Choosing a villa was quite a hard task to ensure that the whole family enjoyed their vacation in Florida. It needed to be centrally located to all the main parks, be furnished to a good standard & have enough to keep the children of 10 & 13 years old occupied on our relaxing days between parks. After hours of research, we found Villa Londra which on paper ticked all the boxes. We were all delighted when we arrived at the villa. The description & photos on the website were all spot on. The villa was clean, well kitted out & the pool was lovely (many an hour spent relaxing in it!). Within minutes drive there is everything you could hope for - supermarkets, gas stations & many places to eat. The parks we went to were all within easy access (Universal, Sea World & Busch Gardens). Right from our initial enquiry on the website, Jan was very helpful & very professional - nothing was too much trouble. After having had the best vacation ever, we are now saving to return in 2014. All descriptive text, templates, photographs and video images are the copyright of the owners and may not be used, copied or reproduced in any form under any circumstances. Copyright (c) 2003 - 2019. All Rights Reserved. Low season prices from $929.00 / £575.00 per week. 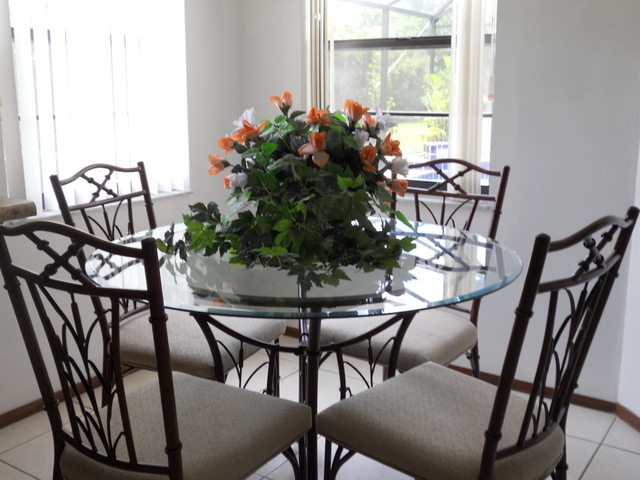 Peak season prices from $1146.00 / £725.00 per week. ¤ Nightly rates from £100/$155. 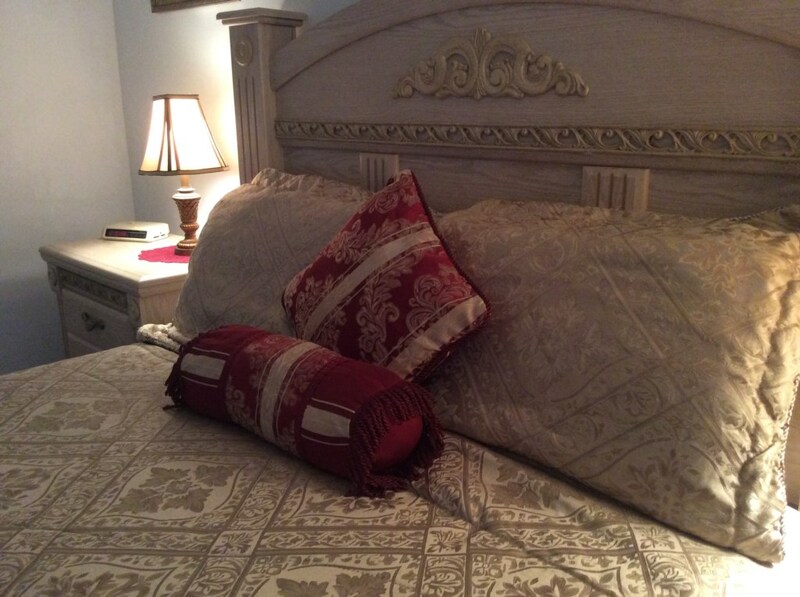 ¤ Reservations of less than 7 nights will incur a cleaning fee. ¤ Reservations of 14 nights duration only accepted during Christmas and New Year period (8 December - 6 January); and Easter. ¤ £150/$200 per week Booking Deposit will secure your required dates. balance 8 weeks prior to your vacation. ¤ Payments are accepted in GB£ or US$, direct UK bank transfer (service charge may apply to non UK transfers). ¤ US bank transfer subject to service charge. ¤ We accept credit/debit cards and PayPal - service charge applies. 24 May 2019 to 05 Jun 2019 - use the form below to enquire about these dates. 09 Jun 2019 to 22 Jun 2019 - use the form below to enquire about these dates. As this was my first time using this site I was very cautious simply for general reasons. However I spoke to Jan and was instantly reassured that she was (a) a person and not some virtual robot about to take my money and (b) filled me in as to the area, locations, timings to get to attractions and so forth. Upon arrival we entered the villa with no problem and my 3 year old went and inspected every room, bed and of course the pool and gave two very enthusiastic thumbs up. We were very happy indeed. We took the two minute drive to Walmart and stocked up on the essentials. We had a TV/Wifi problem but this was mainly due to a storm knocking everything out, Michael was soon on the phone explaining everything and within 15 minutes all was restored. The villa is indeed a good 20 minute toll road to Disney (you can get around the toll but for the sake of $4 it was fine) and everything in easy reach. The restaurants are fine although I would have liked a greater variety but I think that is just a London foodie being in Florida. The steaks were great and my son loves the Olive Garden (3 visits). All in all we had a lovely stay at the villa, which was clean and very comfortable. The owners were so accommodating and friendly. Highly recommend and thank you Jan and Michael for allowing us the use of your beautiful villa. PS the toys and blocks in the garage were a great touch for my boy. He can't wait to go back and play in the games room! Owner's response: It has been an absolute pleasure to guide you on your first experience using OV through to your stay at our home from home in the Sunshine State. We are delighted to hear you found the villa clean and comfortable and that your son gave it the thumbs up too!! Thank you for a 5* review. We look forward to welcoming you back soon. Great villa which is home from home, all facilities you could ask for! Great location for all the Disney parks (15-20 mins away). Also great location for local restaurants and shops including a huge Walmart for all your groceries. Pool area fab and not overlooked. Owners were extremely helpful at all times and would definitely make a return visit! We are delighted to know you would like to stay again in the future, that is a compliment in itself. A warm welcome awaits your return. With our thanks for taking such good care of our villa and this great review. 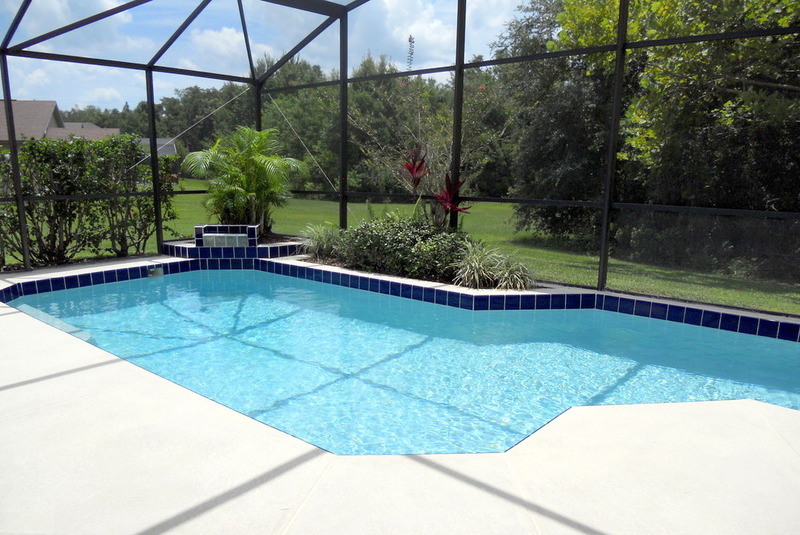 This Villa is perfect for all Orlando theme parks. 15 to 20 mins away for Disney and Universal and the Loop is only a few minutes away. Use the Toll roads to avoid queues. The villa was spacious and modern with great facilities for kids and teenagers! I would highly recommend this villa! The Owners and Manager were very helpful and approachable and made you feel very welcome! We'll be back! Owner's response: Such a lovely family to have staying, we were delighted to hear you had a wonderful stay and that the villa facilities were such a success with the youngsters. We're glad you agree the central location is ideal for the theme parks, outlets and restaurants; we also find it convenient when exploring further afield and for trips to the beach. Your 5* review is thoroughly appreciated – Thank You so much. 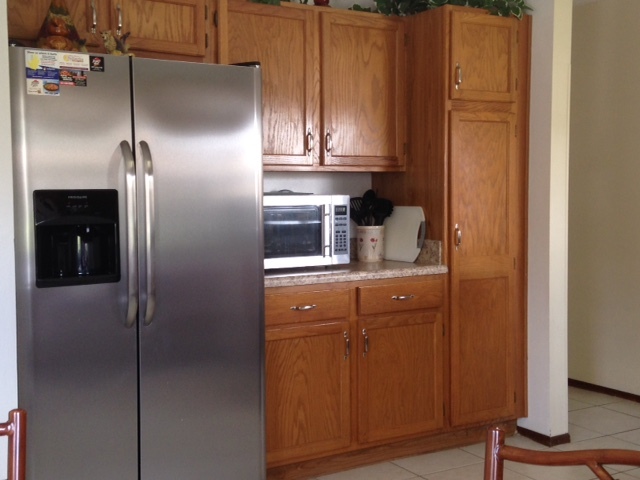 Great property, very well maintained and easy access to everything local. The location is nice and quiet and access to local shops/food is very local. There were lots of unexpected extras in this property for the kids to enjoy. If you like your TV then this is the place for you, massive TV in the lounge area with lots and I do mean lots of channels. I travel a lot with business and the main things I insist upon are a decent shower and a comfortable bed, both are very well provided. Would highly recomend this property to anyone looking at visiting Orlando. Owner's response: Thank you for taking the time to give our villa such a great review, your comments are very much appreciated. Your enquiry will be sent to villa ref 780 only. This page has been viewed 71599 times since 26 Jun 2003.